I'm so glad that you are posting as I'm super curious about repatriation - we are starting to look at moving to US in the next year or so and I'm excited/terrified. I do love how nice everyone is when I go home - friendly friendly! Good luck with everything! I've only been to the US once, but I'll never get over the size of the drinks! How DO people not spend all their time peeing?! Such an interesting read! I can only imagine the shock of seeing North American portions after all those dainty plates in France/Europe. And the choices - my goodness. I lament the lack of choice in Holland but when I was back in Toronto and had to do some groceries I think I had a minor anxiety attack trying to choose salad dressing. Have to confess I found the US portion sizes somewhat revolting when we were there in Dec 2012. And the giant drinks loaded down with ice... ugh. But that's just my ageing sensitive teeth speaking. I'm with you on the customer service though - it's something the French need to learn. One of my friends started off working in Customer Service in Carrefour 20 years ago. Her training consisted of twenty ways to shrug, raise her eyebrows and say "Pffft." Having lived in a bunch of places around the world, I find that it takes about 2 months before I have re-assimilated and it seems natural again. Oh my goodness -- the salsa! That's hilarious! I hate how at restaurants here in the US the server will bring you your bill before you've asked for it (to save time I guess, so you're not flagging them down asking for the check), sets it down and says, "This is for whenever you're ready -- no rush." And then of course you feel rushed! Geez! I'm sure they are "tee-teeing" all the time, which isn't that big of a deal because I feel like public restrooms are easier to locate in the States as opposed to France. Awesome rant. I totally agree. But you know EVERYTHING IS BIGGER IN TEXAS. So get used to it! KIDDING. But they def seem to continue to go by that mentality materialistically as well as physically... womp womp. I am having a good day. I am leaving work to head home (early by almost 3 hours!) to then head to my hometown for a good local Virginia festival - maple sugar festival! Yums for days. I pretty much understand all of your thoughts, I have felt the same way. Especially about the eating vs dining. I always feel so rushed in American restaurants and that makes me feel uncomfortable. I don't want them to bring the check when I still eat. Leave me alone. In Europe I can sit on my table for hours and nobody disturbs me. I had culture shock on the way into very rural Canada as a high school exchange student, and then again on the way home, isn't it funny how our thinking unconsciously adjusts to what's around us? I do love the long, languishing French meals, sans indigestion though! I have gotten so use to the tiny cars in Iceland that I am sure when I go back home I will be in shock as well of the size of all those big trucks, like my dads massive truck! Huge choice of huge vehicles/portions/everything = advanced capitalism/consumerism! Yes, coming back to American service is always shocking after being in Russia for a while. I know I've been away too long when I immediately get suspicious and think "what do they want from me?!" Every time one of my German neighbors snubs my polite 'hello' I get homesick for the US. Everyone being nice makes a big difference. I hope you aren't too homesick or culture shocked. Ten years is a long time. Interesting to see that culture shock works both ways - when you first go overseas and then again when you return home. Of course, I think it might be a bit different in your case since you've been gone for so long. I have a feeling everything will be much, MUCH easier and better for you once Gregory and Fifty join you. But I'm glad you're having fun!! We had the same reaction when we came back to the US. We were shocked by the cars at the airport too. Trucks and SUV's EVERYWHERE! It is shocking, isn't it?!? You'll get back into the groove of things…and of course, you'll reminisce about France often, as you should. Welcome back Sara! Ahhhh I remember these feelings. It may sound weird, but enjoy them! You'll miss them soon enough. Hahaha it's funny, because I notice all these same things every time I am home, particularly the difference in wine prices... holy crap. However, I'd never thought about the vacation vs. living there mindset, it must be off-putting. Hearing about the friendly people though just warms my heart - I guess I always worry it's going to change. I bet Texas has to be probably one of the states that is most UNLIKE the LPV! 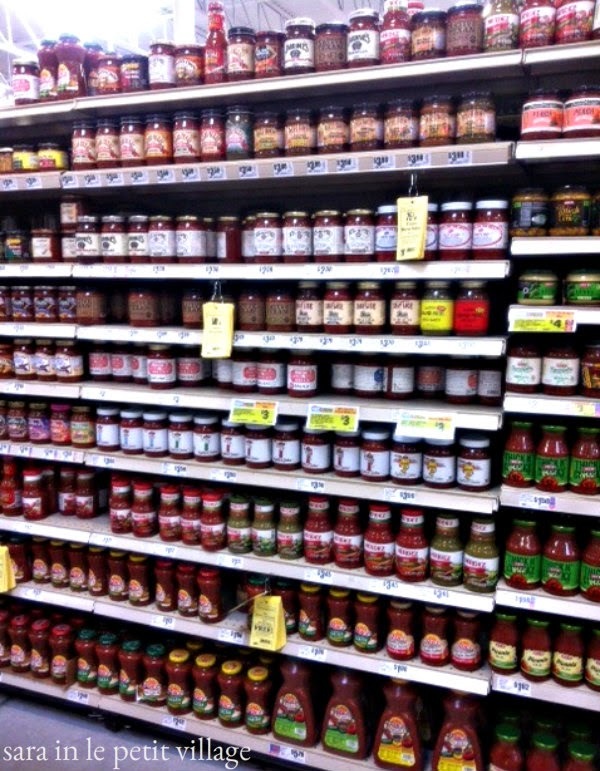 That salsa aisle kills me. I think what you need is a trip to somewhere more like the LPV like, I mean, I don't know...just throwing out a wild hair but, some place like Atlanta?! And yet still the ONE KIND of salsa that would bring me joy is never there. What I don't understand is how there can be 5 million options at the grocery store and still I have to go to 3 different grocery stores to complete my grocery shopping. Having just returned from a really nice, warm, sunny sejour in Sablet, I can say there are so many things to love about life in Provence. It's nice to come back to CA and see family and friends but I could live a long time in France and not miss to much from here. I can SO relate to this! Especially the size of trucks! Always gets me when I go back to Texas!! They are so crazy big!! The first few days back in the US i am always in, what I call, an out of body experience. A can't quite grasp that I'm back experience. It's familiar, but foreign all at the same time!! Oooh, I agree with all of these and feel like, after living overseas for so long...well, it is normal that everything seems wierd right now. Hang in there bella. Once your sweetie is there you will at least be giggling about all of this together! haha when I first moved back I had a meltdown in the peanut butter aisle. THE PEANUT BUTTER AISLE. you'll acclimatize eventually! maybe it will be easier in MA than in TX though?